Cinque Terre, Italy: five small villages, one amazing coastline on the Italian Riviera. I first had the chance to make my way to Cinque Terre while studying abroad in college. It easily became one of my favorite places I traveled to during those crazy few months of my life. From all the hiking trails of varying difficulty to the colorful seaside villages on the cliffs above the Mediterranean, it's hard not to fall in love. All five towns (Riomaggiore, Manarola, Corniglia, Vernazza and Monterosso) are so accessible whether you trek between them on foot or take a quick (sometimes 3 minute) train ride from one to the other. The smaller sections of hiking make up the larger Azure Trail that stretches across all five. However, in 2012, shortly after my visit, a huge landslide destroyed many of the walking paths between them. Now, having returned almost 7 years later, many still have not been repaired due to cost and the engineering needed to make them safe for tourists. It was a bit of a bummer to miss out on some of the paths I remember so fondly but even with some trails closed, you can still have an amazing time! I promise the beauty of the area which is all part of Cinque Terre National Park and is designated as an UNESCO World Heritage Site, will win you over as you make your way through your Cinque Terre itinerary. Many people try to check Cinque Terre off their bucket list by taking a day trip from Florence. This way of traveling gives you very limited time to see the towns and virtually no chance to tackle at least one of the better hikes that can take up to 1 1/2 hours. My recommendation would be to spend two full days in Cinque Terre, giving you ample time to hike and explore at your leisure the first day. Then on the second day, you can hit any towns you missed and go back to the ones you really loved. Make sure you grab the Cinque Terre Card Treno at the first village you stop in. This card will give you unlimited access to all of the hiking trails AND unlimited rides on the train for however long you pay for. They can be purchased at the information buildings near the train station of each stop. These cards are checked on the trails so you must have them on hand. You also must make sure you validate them at one of the validation boxes at each train station. When riding the trains, they can be differentiated by their final stop on the line. If you want to head to a Cinque Terre town that is south of you, jump on the trains to La Spezia. If you want to travel north, you want to trains to Levanto. Cinque Terre is known not just for its picturesque vistas but the different attitudes and vibes of each town. Make time to check out all five to find your favorite! Whether you’re arriving from the north or south, I recommend starting in Riomaggiore during your time in Cinque Terre. Medium-sized compared to the other five towns, it’s a good place to get your bearings. I personally find Riomaggiore the most touristy of the five towns, especially since it’s the first stop after La Spezia, which is a larger hub for trains headed to the area from Florence and Rome. You can grab a quick bite and hop on the train to the next town. Unfortunately, the hiking route between Rimaggiore and the next town of Manarola is one that has been closed since the landslides. The hike was known as the Via dell’Amore or the Lover’s Path and was an easy 25 minute paved trail that hung right above the water. As you walked, you passed thousands of love locks attached to the railings and guardrails as it was tradition, if you have a significant other, to put a lock wherever you can in order to "lock your love". The path would also lead you past a beautiful restaurant built into the cliffside. You can still hike a small portion of this trail from the Manarola end. Make a right when you exit the Manarola train station to follow signs for the path. You can walk just enough to be able to look directly down at the crystal clear sea water. Manarola is personally my favorite town in Cinque Terre since it seems to cater to visitors the least. Any BNBs you find in this town will place you in apartments next to native Italians instead of hordes of tourists groups. You’ll walk past locals going to church, hanging their laundry outside of their windows and drinking at the wine bar next door. It’s so quaint and adorable. In my opinion, Manarola is also one of the more photogenic of the cities in the area not because of sea views or landscapes but of little aspects of the town like water wheels and beautiful stone staircases. These details are what really make Manarola special. Corniglia is another small town in Cinque Terre and is the starting point (if your heading northbound) to the best hiking trail in the area, which was not affected by the landslides! If you take the train to Corniglia, you can begin the hike in town. Just so you’re mentally prepared, Corniglia is located at the top of a hill, which may end up feeling more like a mountain depending on how in shape you are. To summit, you’ll put your thighs through an upward battle of roughly 400 steps on the Lardarina Stairway. You may luck out with a cute old Italian man serenading your trek with an accordion halfway up…it really keeps you motivated! It’s also a great warm-up for the roughly 2 hour hike between Corniglia and the next town of Vernazza. We stopped in Corniglia to load up on pizza (gotta carbo-load for hiking right??) and bought bottles of water to keep us hydrated. Corniglia is often the forgotten town of Cinque Terre, especially when visitors are only exploring for one day. However the lack of people compared to the other towns allows you to stroll through the cute little alleys in solitude before you embark on your hike. The Corniglia portion of the Azure Trail begins at the elevation of the city but will steadily take you up even further. You’ll begin your hike trekking past olive orchards, vineyards and greenery. The path can get a bit rocky at times, with natural steps and uneven ground throughout (watch your footing! ), but eventually you’ll be walking along the Mediterranean with views of boats in the distance and bright blue water shining back at you. This trail provides the most beautiful panormamic views of both the towns of Corniglia and Vernazza. As you get further down the path, make sure you look back every once in a while to see your progress as Corniglia gets smaller and smaller. It’ll make you feel pretty darn good about how far you’ve hiked. A fun little bonus on the trail between these two towns is Bar Il Gabbiano a perfect stop for a bite or a drink in the middle of the mountain trail. This bar knows how to cater to hikers...lemon and orange slushies (both alcoholic and non-alcholic) are the drink of choice to cool down. The lemon slushy was so heavenly from fresh-squeezed lemons (a staple of the region), I ended up with a brain freeze from gulping it down so fast. The small cafe has limited seating inside with panoramic views of the water from its windows. After a mental breather, you will be refreshed and ready to continue your hike and soon you will come upon beautiful views of Vernazza! After your long hike, you'll definitely want to take a moment for a bite to eat...now is the time to hit up that gelato! You'll have multiple gelato shops to choose from in Vernazza, so you can stop into each in search of your perfect flavor combo. However, my favorite is definitely Gelateria Vernazza. Vernazza is also one of the more beautiful towns to explore. The port is the bustling heart of the city with people dining outside, fishing boats docked and bobbing in the water and beautiful views worthy of any photo op. If you’re feeling up to it, you can continue hiking the Azure Trail from Vernazza to the last town of Monterosso. This part of the hike will provide stunning views of Vernazza as you trek further north. Many people try to time this hike with sunset to snap some amazing pictures of the seaside buildings as the sun goes down. The full trail clocks in at about 1.5 hours of hiking time. Monterosso is my favorite city for great dinner atmosphere. This place is BUSTLING and the outdoor dining options are plenty. When you grab dinner, make sure you order at least one item with pesto. This area of Italy is the birthplace of the delicious basil-based sauce so you'll have many options: pesto lasagne, pesto pasta, pesto with fish; you really can't go wrong. If you’re looking for a relaxing beach day, Monterosso is your spot. Monterosso has the most lodging options of all the towns, many of which are a quick walk to the beautiful beach which is the cornerstone of the city. You can rent a chair and beach umbrella and take in the sea and sun. We also ended up back in Monterosso for breakfast the next morning. Since there are so many people staying the night in the town, there are many more breakfast spots open earlier to get a jump start on your day. Cinque Terre provides the most amazing photo opportunities whether you hike the trails or just explore the towns. It’s an area with so much natural beauty. 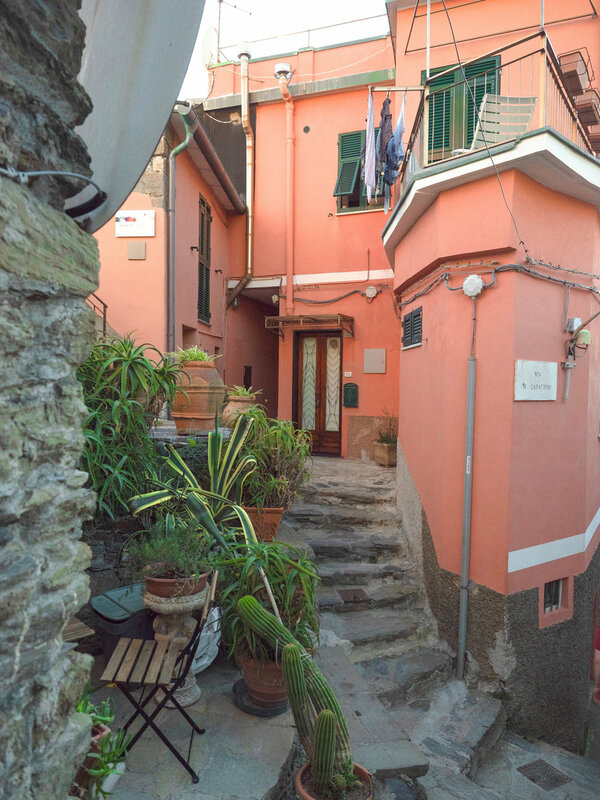 Whether you explore for one day or three days, there are many corners of these villages that you can wind through to fill up your Cinque Terre itinerary. Due to the increasing number of tourists each year, I would definitely recommend traveling during the tail-end of the high season: March-May or September-October. Less tourists around you means a more relaxed vacation and safer conditions on the trails. We went in the middle of October and it was still very warm. Make sure you add Cinque Terre to your Italian trip plans! The magic of the Italian Riviera extends much further than Cinque Terre. Many additional towns along the coast provide perfect stops for half day or full day trips, just hop on a train and go! One of the more beautiful spots we visited was Genoa, a town that doesn’t really feel like it’s changed at all in the last 100 years. Read more about traveling to Genoa HERE.